October 2010 is the 25th year of Breast Cancer Awareness Month. Did you know:One in eight women will be diagnosed with breast cancer in her lifetime. 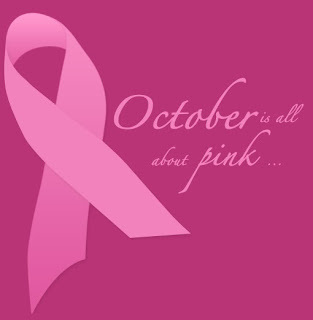 Breast cancer is the second most common cancer in American women (skin cancer is the most common). There are approximately 2.5 million breast cancer survivors living in the U.S.
Men can also develop breast cancer, but the disease is 100 times more common in women. For the best chance at early detection, women should have a yearly screening mammogram beginning at age 40 (though there has been some controversy about this, this remains the American Cancer Society’s recommendation). In addition, women should also have an annual clinical breast exam and perform a monthly breast self-exam. For more information, visit the Susan G. Komen for the Cure Web site or National Breast Cancer Month. Chances are you know someone touched by breast cancer, whether friend or family member. My best friend Kerri was diagnosed at age 47 (you can read her story here). Since then, I’ve become more aware of breast cancer research and recommendations, and more careful about my own habits. This month, I encourage you to educate yourself about breast cancer, support companies that donate to breast cancer research and/or donate yourself. Here’s to a healthy future! Awareness is so important, thanks for sharing. When we have our health, we have everything. Joanne--So true--without our health, we can't enjoy the simple pleasures and everday adventures. Have a great weekend (or even a latte). Thanks for raising awareness, Kathy! My aunt is a two-time survivor. One of my co-workers had breast cancer in her early 20's (!!!). She is doing good 5+ years later. Just goes to show that cancer does not discriminate between age groups. Hope your friend is doing ok.
Krista--Thanks. I'm glad your aunt and co-worker are survivors! My friend is doing well, too. It's really sobering how many have been touched by the disease.